It’s perfect for starting seeds, and keeping the starts fed. It’s perfect for delicate, low feeding plants like peppers or strawberries. FC also works great in situations where you want all the benefits of our amazing compost and mastodon peat but still want to feed liquid nutrients as well. So what’s in it? Coco peat is the proven natural alternative to mined peat moss. It lasts three times as long as peat and will re-wet easily without using wetting agents. It can hold up to 8 times its own weight in water. BioDynamically composted chicken litter and sawdust at over 140F and then cured. This adds energy including a month’s worth of starting nutrients. It’s light enough to allow mycorrhizal growth along with the trillions of other organisms cultivated through the BioDynamic compost process. One of the first true BioDynamically prepared potting mixes available. Yet one more way we build beneficial aerobic organisms, compost tea creates its own living food web of beneficial organisms and light nutrients. Heat expanded volcanic rock is the world’s premier organic aeration and drainage agent. Kelp meal is a very high-quality organic fertilizer. It is a good source of nitrogen and potassium, and contains minerals, amino acids, and trace amounts of other micronutrients. It makes it’s own natural plant growth hormone. We also like it for its root stimulant effects and as a tonic for transplant shock. Enhances germination, plant growth, and crop yield. Improves root growth and structure and enriches soil with micro-organisms, adding plant hormones such as auxins and gibberellic acid. Feeds beneficial microbes and adds carbohydrates to enhance the flavor of fruits and vegetables. Harvested from an archeological excavation in the Colorado Rockies, this amazing organic material is over 45 million years old and is a secondary source of humic and fulvic acid as well as iron and other trace and micro nutrients. And it had Mastodons in it! BioDynamically composted chicken litter that is carbon balanced and then composted at over 140F but never above 160 and then fully cured. To insure it is fully composted we take a full year to complete the process. We have a diversity of both beneficial fungal and bacterial organisms that have made the nutrients super bio-available, yet super gentle for seeds and starts. It’s light enough in nitrogen to create short, dense early growth while geting a high feeding plant a week or two till feeding is necessary along with the trillions of other organisms cultivated through the BioDynamic compost process. 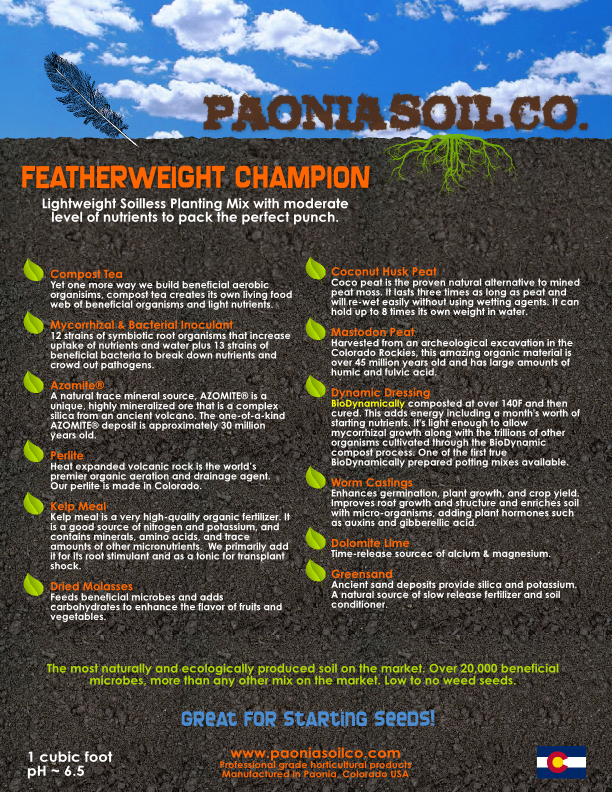 One of the first true BioDynamically prepared potting mixes available. Ancient sand deposits provide silica and potassium. A natural source of slow release fertilizer and soil conditioner. Time-release source of calcium & magnesium. Works with the dolomite limestone and gypsum to create the proper calcium to magnesium ratio. Our last calcium based micro-nutrient, gypsum provides just the right amount of sulfer with it’s calcium while balancing the pH of the limestone. A natural trace mineral source, AZOMITE® is a unique, highly mineralized ore that is a complex silica from an ancient volcano. The one-of-a-kind AZOMITE® deposit is approximately 30 million years old.